Located on a hillside in Colombier, Leana Villa has everything a couple needs for their Caribbean vacation. The villa is actually made up of 3 separate spaces – one area for the bedroom, one for the bath, and one for the living area and kitchen. Views can be enjoyed from all 3 living spaces, and there is a heated infinity pool that overlooks the water. Groceries, restaurants, shops, and more can be reached within 5 minutes by car, so it’s easy to get out and explore the area. Leana Villa is peaceful and private – great for honeymooners or couples wanting to get away. Perfect for couples and honeymooners! 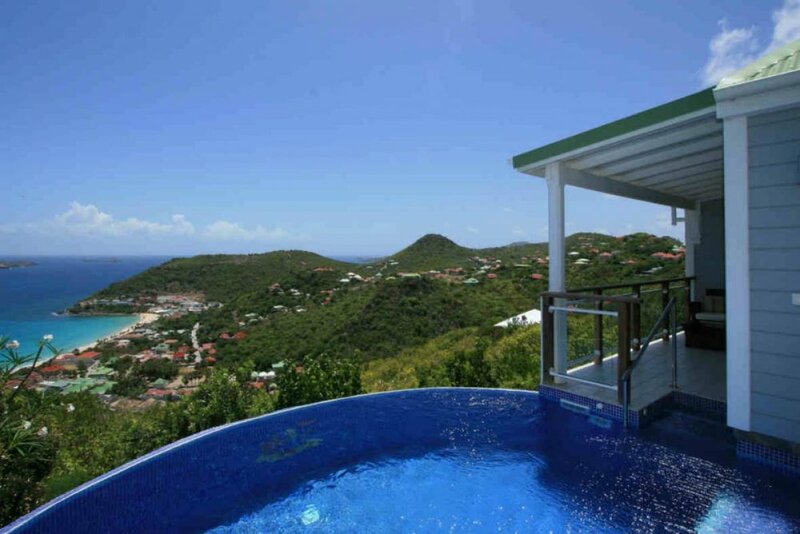 Leana Villa is a 1-bedroom, 1 1/2-bath intimate hillside villa comprised of three separate pavilions that have a great view over Flamands. The bedroom, which features a queen canopied bed and a toilet, has a terrace where you can take in the view and leads to the infinity pool. The bathroom pavilion has a large shower that also looks out onto the view. The comfortable living room and fully equipped kitchen are in another pavilion. The dining area is situated on a covered terrace that overlooks the garden as well as the view. Leana Villa is the perfect choice for couples and honeymooners. The infinity pool can be heated during High Season; it also offers Chromatherapy & Swim Back Current. Please inquire for Christmas/New Year’s season rates. U.S. Satellite, iron & ironing board, deck chairs & beach chairs, beach umbrella, cooler, beach towels.